Specialty window and door handling equipment can solve many of the problems faced by the glass industry that ultimately lead to higher manufacturing cost, such as breakage, creating safe working environments and overall product quality issues. A properly designed and integrated window and door assembly line can provide a tremendous cost savings. Our window and door assembly lines are designed to provide the right amount of material, in the right condition, at the right place, time and position for the right cost and method. 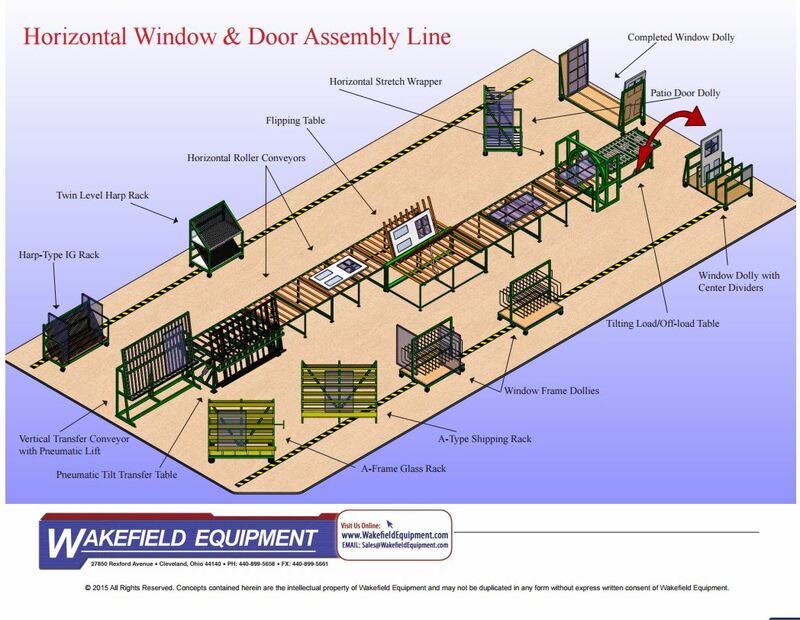 Wakefield has created the following sample Horizontal Window and Door Assembly Line so you can see how our products can work together seamlessly. All of our window and door assembly line components are versatile and can be custom built to fit your needs. Contact our sales team to learn more about any of our window and door products and let us help you design your window and door assembly line.